For the last two years, SMEA has hosted a booth about ocean acidification at the Hama Hama Oyster Rama festival on Hood Canal. Ocean acidification is a pressing environmental issue, and it involves the decline in ocean pH due to increased carbon dioxide dissolving into the ocean. This drop in pH reduces shell-building organisms’ ability to remove calcium carbonate from the water, which in turn weakens their shells. A group of students from one of our classes presents information about this serious environmental problem in the form of a short activity in which participants test the pH of seawater, then blow bubbles into the water to see how the added carbon dioxide changes the indicator from basic blue to acidic yellow. 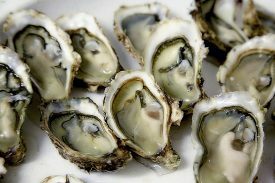 This activity is aimed at kids visiting the Oyster Rama with their families, and fits into the event’s goal of educating the public about shellfish ecology and aquaculture.